Experience the breathtaking feeling of floating silently above the Outback as the morning light begins to illuminate the MacDonnell Ranges on this awe-inspiring adventure. Enjoy light refreshments & sparkling wine in the middle of nowhere! 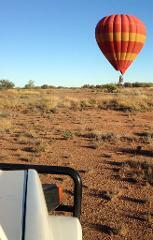 Floating gently in the air, appreciate the vast remoteness of the Australian outback. Keep an eye out for kangaroos as the balloon crosses above spinifex grasses, mulga scrub & cattle stations.Enjoy light refreshments & bubbles once landed. 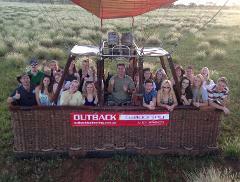 If you would like to come and watch your friends/family take a hot air balloon flight then a balloon chase is for you! 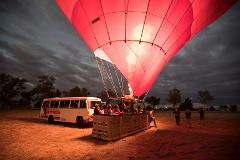 Must be booked in conjunction with at least 1 adult booked on a balloon flight.Children must be accompanied by an adult.